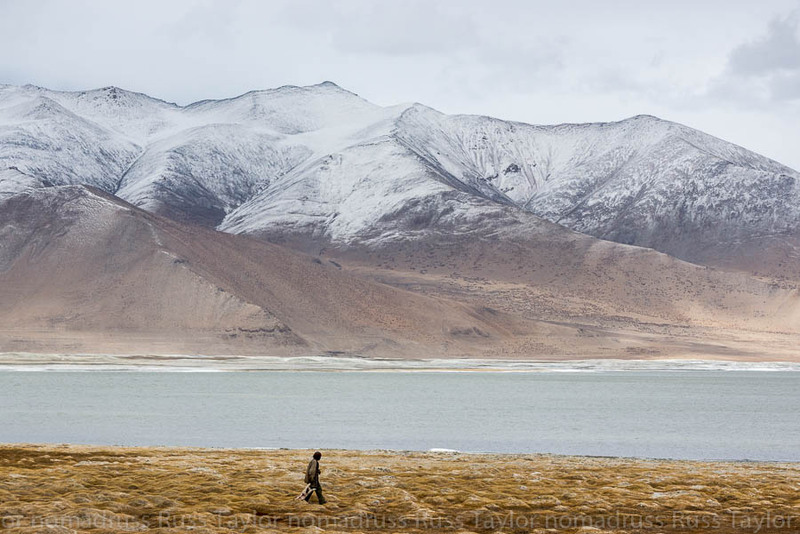 On our way around Tso Kar, towards a small nomadic camp, we passed a nomad carrying what appeared to be the carcass of a goat. When he joined us in a tent the next day he explained the story. 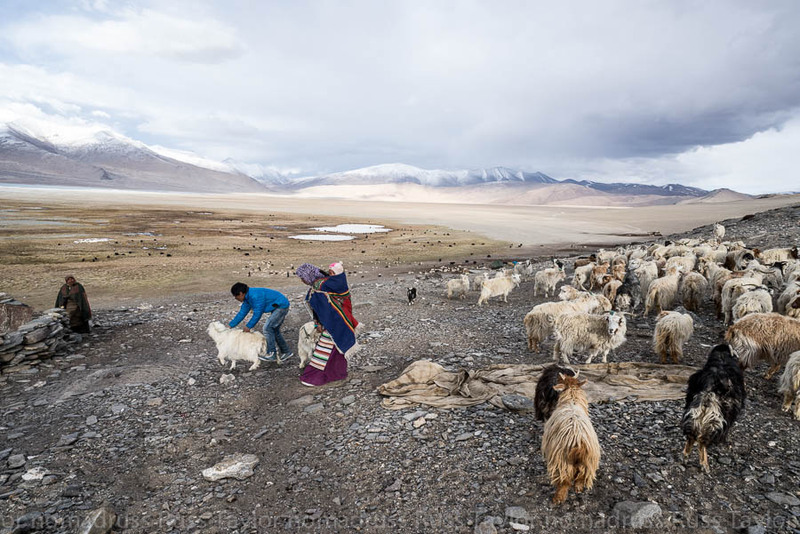 His goat had been attacked by an eagle, and then subsequently by a Tibetan wolf. He had fought them bought off and carried the carcass back to camp. They weren’t going to make off with it. 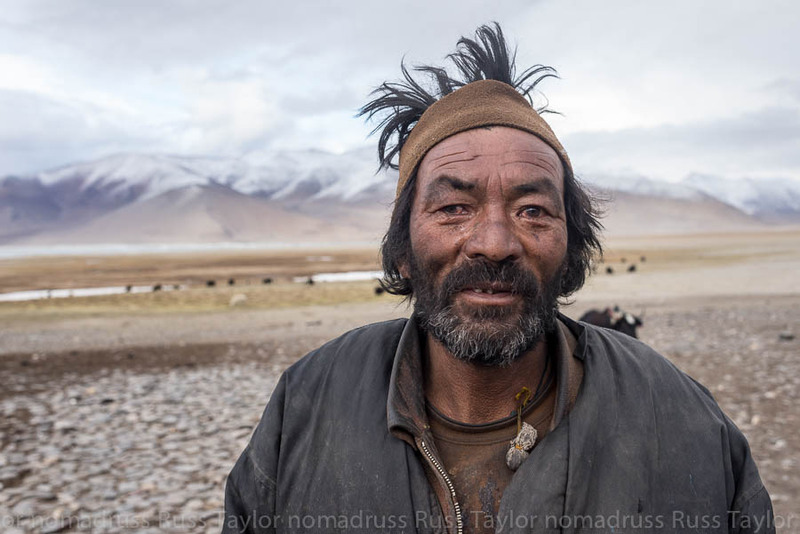 Such is the life of a nomad, or least the story as it was related to me. 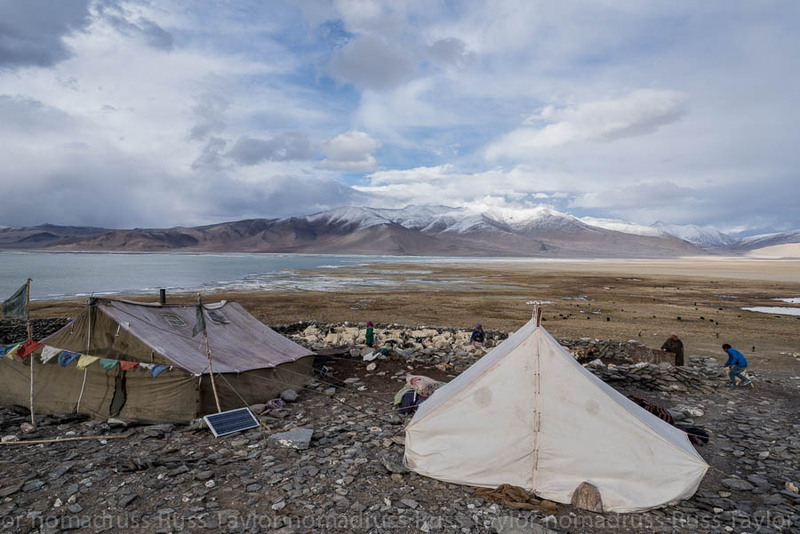 A Tibetan nomadic group, consisting of around 6 families, lives along the Southwestern shores of Tso Kar lake from late spring into early summer. The fierce mountain winds can certainly make life cold and challenging, but it’s a simple life, and a good life for them. 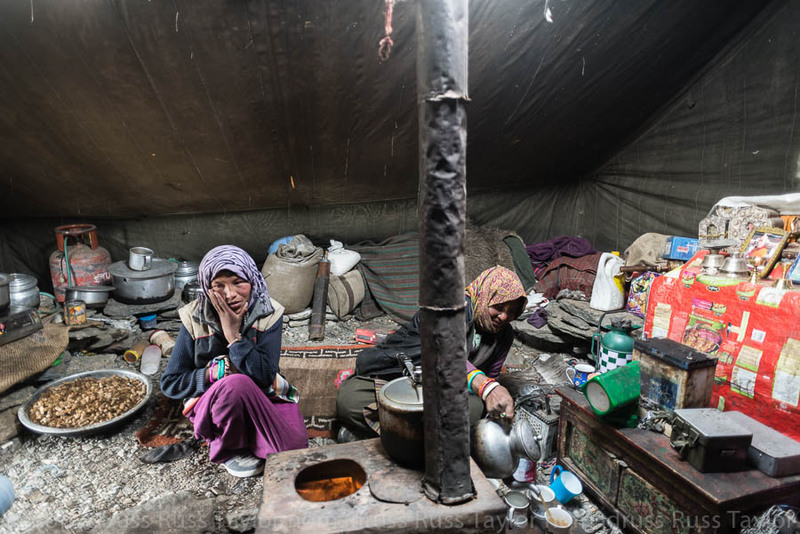 Life largely revolves around taking care of goats, milking them for milk and cheese, and selling pashmina to Kashmir. 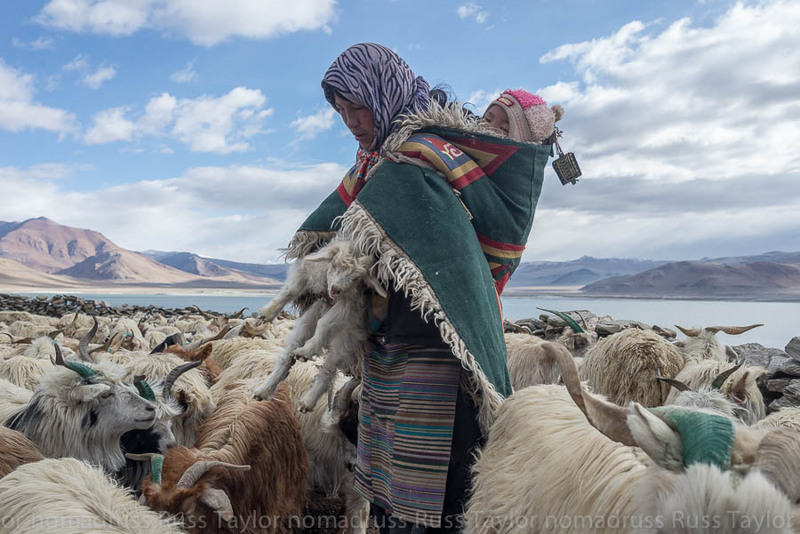 A goat is worth around 8000 Indian Rupees ($150 US) so the nomads aren’t poor, they do quite well. Relatives in the main town of Leh help in the marketing of goods. 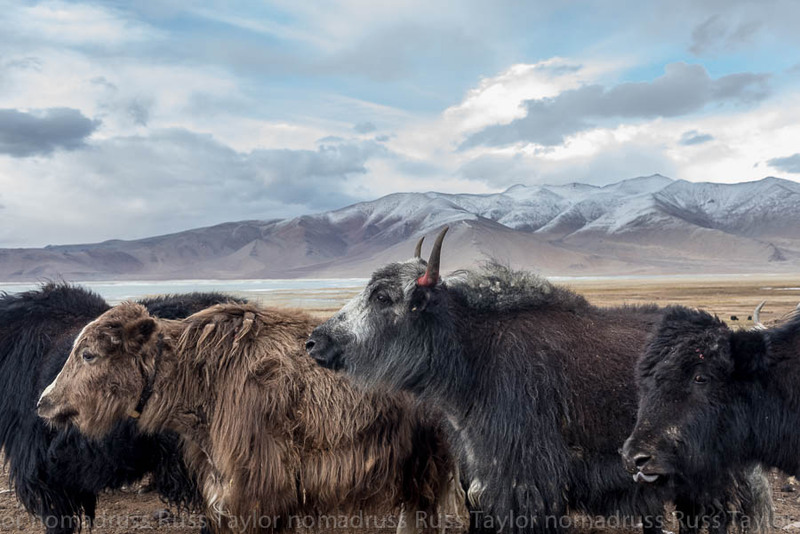 The nomads also have a sizable herd of yaks. 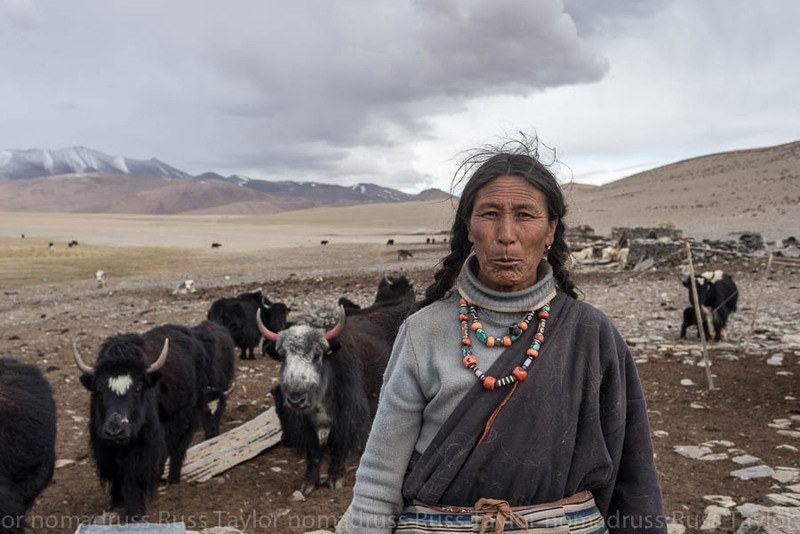 The yaks were traditionally used for transportation, helping to carry goods from pasture to pasture, but that part of the culture is undergoing change. The nomads occasionally use lorries to transport their goods now. The yaks do provide a good deal of sustenance, along with rice and potatoes. 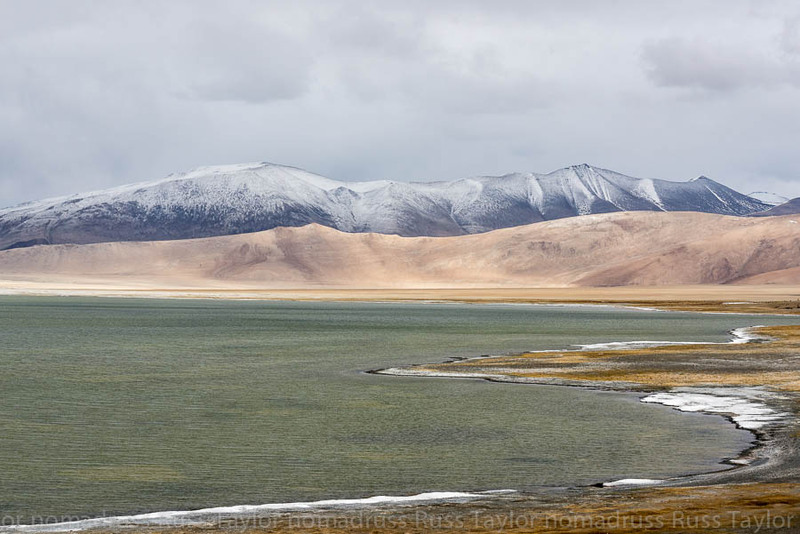 This post will take a look at one Tibetan group along the shores of Tso Kar, all photos were made in one 36 hour period. A nomad carries the carcass of a goat back to his camp. It had been attacked by an eagle and a wolf. 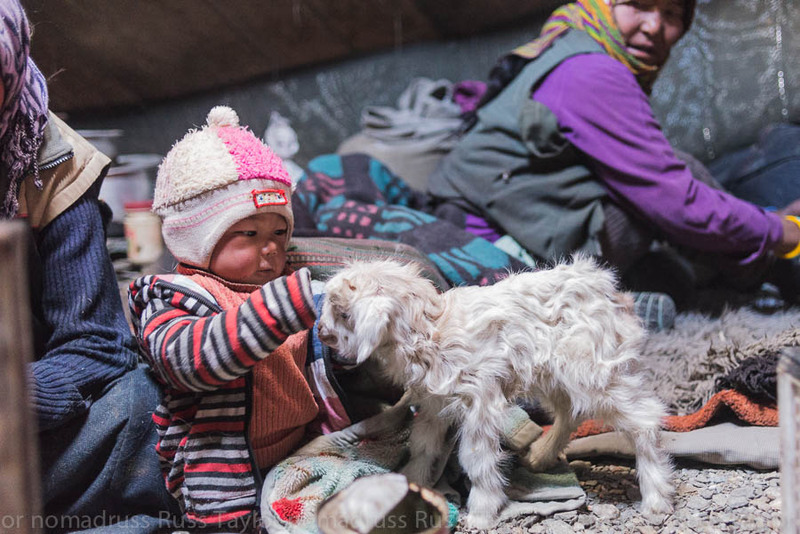 A child plays with a baby goat inside the tent. Sometimes young goats are kept inside the tent on cold nights. If you enjoyed the post, please feel free to share it, thanks! Fascinating stuff. And, the photos.. You are looking happy! I’m always happy being up there! 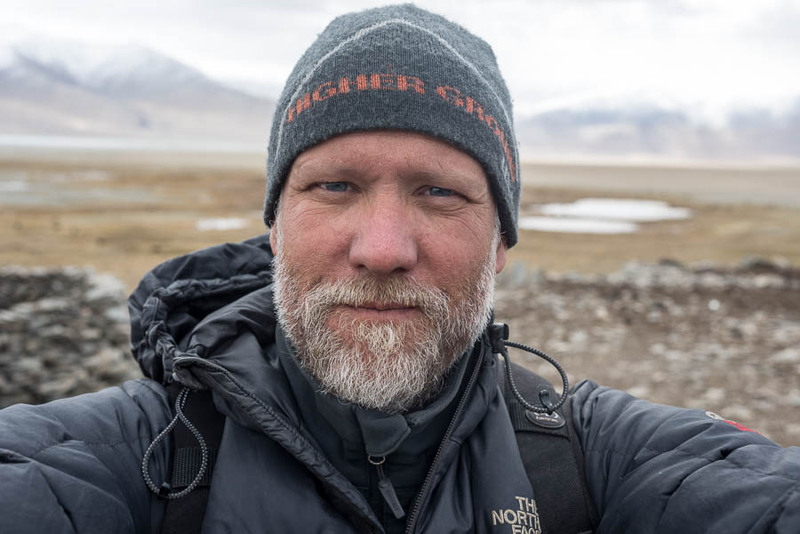 Nice story and photos too! I’ll echo Chas Spain: Exquisite story. Just beautiful. Your photography is sublime. It makes the viewer feel like they are a part of this life – it’s very intimate. Makes you care about what you’re seeing, interested. I love the photo of the baby playing with the goat most, but I would spend time staring at each in a gallery. Thanks, it’s nice to hear that you’d enjoy viewing them in a gallery, because I’d like to get them in one. Appreciate your thoughts! Stunning pics Russ. Photos have inspired many of my travels, and I think I might have some more places to add to the list. 🙂 Thanks for sharing. Thanks Jenny, I’m always glad to know that my photos inspire others! Looks like you’re making some good adventures of your own! Thanks Arret for the kind words on the photos. It is a hard life, and it seems to be a good life as well! yes: they have values (i.e solidarity) that we have a little bit forgotten and that makes the link between people so strong and rich. Love the image of the baby playing with the kid. 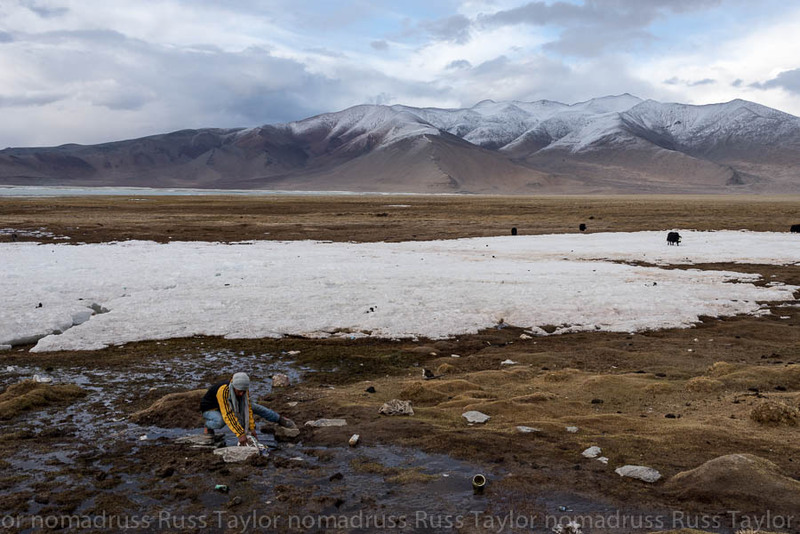 Such an intimate portrait of nomadic life. I’ve always wondered if they have any vitamin deficiencies with the lack of green vegetables and fruits – just curious. Or are their bodies adapted to that diet which they’ve had for hundreds of years. I imagine they’ve pretty well adapted over the centuries. Their diet is animal based and their life expectancy is longer than some Asian countries where rice and vegetables are largely consumed. It might give the vegan pause. Thanks for the kind words on the photographs. as usual Russ, you do great service to those you visit, both in person, in photos, and in words………..
Holy smokes, these are beautiful, Russ. There is such wonderful juxtaposition between the sumptuous, almost silky-looking far mountains and the ‘grittiness’ and reality of the foreground. Absolutely amazing work. Thanks Karen, I was really happy with this work. And I have really come to love these people. Appreciate it! Reblogged this on padsar72's Blog. Congratulation for this reportage! This a very hard experience! Good luck! I think this series is my favorite so far. So may images were just perfectly captures. So many that I REALLY liked. Yes, you should show these in a gallery! 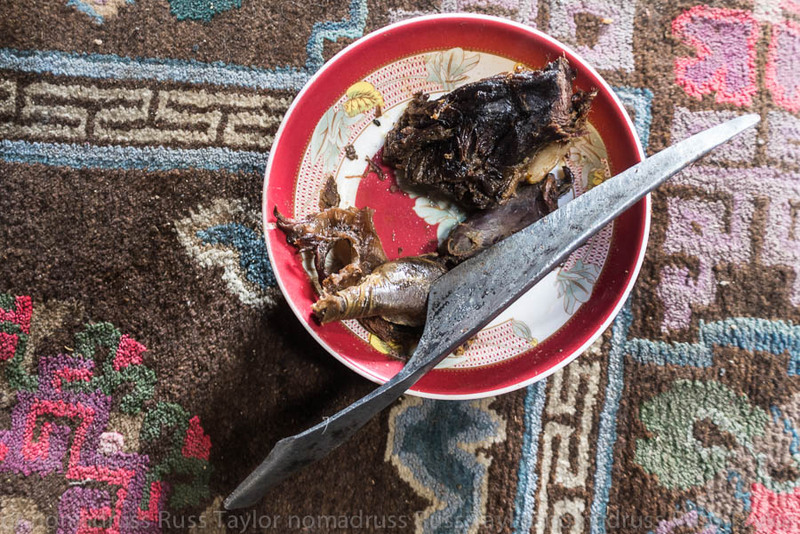 Love the utensils in the yak lunch photo. I’m glad you noticed that detail, it was a beautifully hand made knife. This was also my personal favorite of the recent nomad series. Thanks for the kind words, and I’m glad you enjoyed it! That last line of yours is great, thanks! 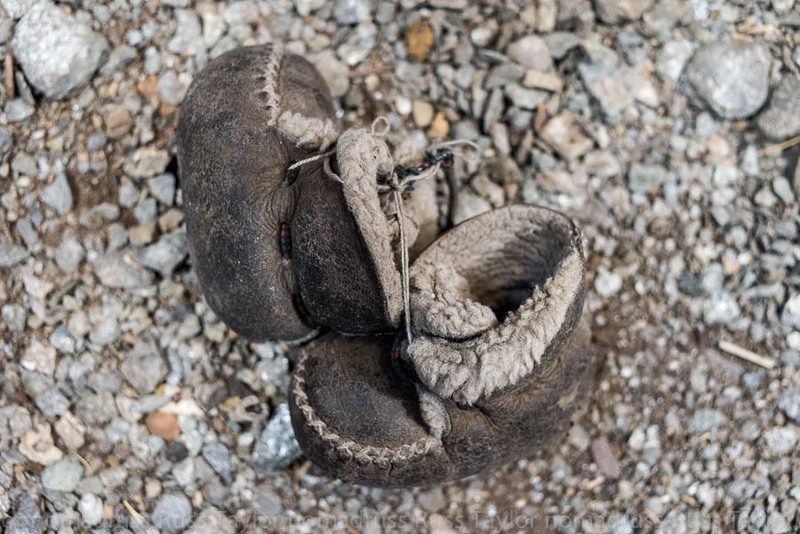 Reblogged this on Ethnographic materials ML..